Egypt's Supreme Council of Antiquities has stated that the mummy which had been happened upon at farms in the governorate of Al-Fayoum are pharohnic and priceless. A council's committee said that the mummy belonged to an important figure in the pharaohnic age. It cited advanced and excellent mummification materials and methods. It called for immediately tranferring the treasure to the Egyptian Museum in downtown Cairo. The fact that variations on this story keeps rearing its head is a sad reflection on the threat to many monuments in Egypt. As well as highlighting the problem at Giza, this piece suggests that solutions have been proposed, but were rejected by the SCA who want more immediate fixes. Groundwater in Cairo's Giza Plateau is coming closer to the foundations, columns and walls of antiquities, threatening structural damage, according to scientists and engineers here. In some areas, flooding has already begun, with an Egyptologist pointing out serious damage to archaeological excavation works. Egyptian hydrologists and technical engineers are warning of the dangers posed by the rising water table caused by farming, urbanization and residential housing near temples. 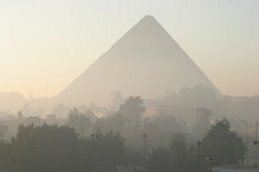 Reda Mohamed el-Damak, director of the Center of Studies and Designs for Water Projects at Cairo University's Faculty of Engineering, told Kyodo News that groundwater poses a threat to the Sphinx, carved from the bedrock of the Giza Plateau, on the outskirts of Cairo, some 13 kilometers southwest of the Cairo city center. He pointed out the latest measurement readings from the site show that groundwater is only ''4 meters deep under the Sphinx.
'' ''It is not pure water, but rather sewage containing toxic waste and chemicals,'' causing structural damage to the temples, Damak said. Damak is now spearheading a team of the faculty's scientists to try to save antiquities on the Giza Plateau from groundwater, which hydrologists say comes from the nearby el-Mansuriya Canal, a secondary drainage channel located some 500 meters away from the Sphinx area. Hafez Abdel Azim Ahmed, director of the faculty's Archaeological and Environmental Engineering Center, told Kyodo News in an interview that the residents of Nazlet el-Samman village at the foot of the pyramids throw garbage into el-Mansuriya Canal, ''clogging up the drain and causing the water table to rise and spill over the Sphinx area.
'' ''This water also originates in the nearby green area, which is continuously irrigated without a drainage system,'' he said. Damak said he proposed to Zahi Hawas, secretary general of the Supreme Council of Antiquities, two projects -- a short-term project and a permanent one -- to save the monuments from groundwater. ''We offered an optimal and permanent solution to Zahi Hawas. We proposed to build a 30-meter deep diaphragm wall in order to isolate this depression and drain off the water into smaller wells to reduce the level of water table. However, he rejected the project, because he wanted quick solutions,'' Damak told Kyodo News. There had been criticism leading up to the event as tickets did not sell so rapidly at first to justify the expense - hence my ability to purchase a ticket so easily the day before the concert. Ramadan fell over the Millennium that year so some Islamic groups complained bitterly about the cost and it's timing with Ramadan. However, the concert began after sundown and ended with the sunrise so it did not interfere with the traditional sunrise to sunset fasting period of Ramadan. Another major bone of contention was the proposed pyramid capstone. Certain critics claimed Zionist Freemasonry was being imposed upon Egypt since the capstone looked eerily similar to the Freemason pyramid symbol on the American dollar bill. Jean-Michel Jarre was keen to incorporate Egyptian elements into his concert from singers, dancers, and instruments. For this reason despite my yearning for Pink Floyd I believe Jarre to have been the right choice. He made the event very much for the attending Egyptians. His music was more Millennium-minded as he blended old and new musical styles together. Jarre scored major points with the Egyptian audience when the ghostly voice of Umm Khulthum, Egypt's diva goddess, floated out on the misty night air. The concert crowd went ecstatic. Catch any cab in Egypt particularly in Cairo and you will hear the lingering hold Umm Khulthum continues to have on Egypt. A SCOTTISH archaeologist has discovered what he believes is the final resting place of a 5000-year-old lost mummy — widely regarded as the holy grail of Egypt. This highly sensitive area, now engulfed in desert sand, was once the great necropolis of Memphis —Egypt’s main city for 2500 years —and is believed to hold untold riches, which prompted Napoleon to send an expedition in 1798. Ian, director of The Saqqara Geophysical Survey Project, has led surveys in the region since 1990 using unobtrusive scanning technology and now believes he’s within touching distance of the most coveted treasure of all. He revealed, “Most of the archaeologists working in Saqqara have been looking for Imhotep. “We’ve now found two large tombs that fall right within the area where we think he could be. The largest tomb is immense — around 90 metres long by 50 wide, with walls more than five metres thick. “Right next door is a second tomb, around 70 by 50 metres with very thick walls and a complicated internal structure which could point to a courtyard or temple. “They dwarf everything in the area — Imhotep may have designed his own tomb to compare with the Step Pyramid he built. A person of his standing could command the artisans and labour needed to build such imposing structures. Although Ian’s find was made last year he hasn’t released the information until now because he’s had to publish his findings and present them to the Supreme Council of Antiquities — the regulatory body for any archaeological work in Egypt. The Saqqara Geophysical Survey Project has its own web page. There is also an image gallery. The clock is ticking down to bid farewell to one of the bleakest years, locally, regionally and internationally. Worse, hours before 2007 would fade away ex-Pakistani prime minister Benazir Bhutto was assassinated. However, as long as domestic tourism industry is concerned, the 2007's harvest was encouraging. For instance, official reports to be released next week will confirm that Egypt's tourism made a record in the number of tourists, who visited the country during this period. Moreover, these official reports will disclose that Egypt's revenues were the highest in decades. It is known that the contents and conclusions of these reports are made jointly by the Central Agency for Public Mobilisation and Statistics on the one hand and the Central Bank of Egypt on the other. Accordingly, tourism industry offered tens of thousands of jobs to Egyptian people in 2007, the same year in which the Ministry of Tourism intensified its programmes to broaden the skills and the expertise of staff members and workers belonging to tourism industry. The quality of services offered in different tourist sites and facilities was also upgraded.Nonetheless, we should admit that the penultimate two months in 2007 witnessed negative phenomena, which had its implications on the domestic tourism, regardless of the fact that such phenomena indicated the remarkable success of Egypt's tourism. For example, hotels were overbooked as a result of increasing number of tourists planning to spend their holidays in Egypt. On the other hand, compared to leading tourist-exporting countries, the Russian market came the first. Moreover, by exporting 1.5 million tourists to Egypt in 11 months this year, the Russian market must have made a record. In the meantime, the British and German market are likely to separately export more than one million tourists very soon. These figures substantiated speculations that the number of tourists in Egypt in 2007 went beyond 10 million. 9.2 million tourists spent their holidays in Egypt last year. Personal: If you usually phone me on my mobile . . . Sorry to use the blog as a personal communication tool! But to all of you who usually contact me on my mobile phone, please don't do so for the time being. As I took my jeans out of the washing machine yesterday, my mobile phone fell out of a pocket with a sad, wet thud. The SIM card has survived, but the phone has joined Osiris, and is no longer of this world. The replacement won't be with me for a week or so (the number will be the same). All the more embarassing given that I worked for Carphone Warehouse for several years and used to hear hard-luck stories about drowned mobiles regularly :-). I'm in a bit of a tearing rush today, so instead of some sensible archeaological photos, here are a couple of touristy photographs taken from (and of) the cruise boat that I was lucky enough to be on in March 2007. Click the thumbnail to see the full sized image. Thanks again to Pierfranco Dotti for pointing me to another English-language article on the Italian archaelogy website Archaeogate, which has an Egyptology section. There is an update about the site of Narmouthis dating to November 2007, but not previously listed here. The archaeological Mission of the Pisa University - with Prof. Rosary Pintaudi, Messina University has effected a mission during the month of November 2007, in the archaeological concession of the Pisa University at Medinet Madi in Fayum, in continuation with that of April 2007. Inside the fortress has been continued the exploration in the lodgings of the soldiers, in the South half of the camp and the West-North area. The long wall, is confirmed as the raised base or bema; on the axle of the door North, existed the "Chapel" for the imperial cult, flanked by two rooms; the colonnade that departed from the door North (on the model of Kasr Qarun) arrived near the long wall, and the raised zone of bema was reached by 4-5 steps. Outside of the castrum, in the north zone, has been discovered a "forno", maybe industrial maybe for alimentary aims. In April 2007 had been discovered inside the castrum a complex hydraulic system and till now without parallel, certainly worthy example of the hydraulic engineering of the Romans, a square cistern (side: m. 3,35) inside the castrum cut in the rock, and entirely covered by a vault in fired bricks. See the above site, with a site plan and photographs, for more details. PART III. Has the Media Changed Archaeology? “Archaeology fascinates the public. As a result, archaeologists deal with media and media issues much more regularly than colleagues in other academic disciplines. Archaeologists need mass media to communicate their research to the public who read, support and, ultimately, fund their work. Left Coast Pressis a relatively new publisher of academic titles, launched in 2005. Egyptology titles can be found via the site's search engine. I am very attached to the Petrie Museum of Egyptian Archaeology (London, U.K.), so here's a ruthless appeal on the behalf of their forthcoming publication, which looks like an excellent enterprise. An appeal for the publication of Unseen Images: the photographic archive in the Petrie Museum Volume 1 - Gurob, Sedment and Tarkhan has been launched. The publication will include some of the Petrie Museum's extensive archive of unpublished glass and other negatives that cover excavations dating bakc to Petrie's own first experiments with excavation photography. The entire archive of photographs need to be digitized and conserved. All contributions will be acknowledged in the publications and donors of £50.00 and more will receive a copy of the book. The appeal closes on the 21st January 2008. Donations should be sent to: Friends of the Petrie Museum of Egyptian Archaeology, Malet Place, London, WC1E 6BT. From the emails I have been receiving, and the sheer number of newspapers and online news services that have run with this story and commented upon it, the idea of the possible introduction of this new law has done little more than estrange people world wide. Whilst there is often considerable sympathy with Egypt's attempts to repatriate artefacts taken from the country illegally, there has been nothing even faintly resembling a positive reaction to the copyright law. Those who aren't deriding it are simply perplexed at how it could be enforced. Even a formidably qualified copyright counsel, William Patry, who has advised Egypt on copyright issues in the past, is unable to see how the law could be enforced in other countries. My question: Can you copyright ancient monuments that have no known architect? The Berne Convention for the Protection of Literary and Artistic Works provides a mechanism to extend protection to the "authors" of works of architecture. Some sculptural monuments by identifiable artists have copyrights. The Statue of Liberty — by Frederic Auguste Bartholdi — has had one since 1876, ten years before it was dedicated in New York harbor. And though the Eiffel Tower has been in the public domain for years, its night time image is not. Its decorative electric light display is copyrighted, which effectively copyrights the tower at night, so commercial photographers have to pay a fee to take its picture once the lights are on. But I'm not aware of any ancient monument subject to copyright protection, and I'm wondering if a copyright claim on the pyramids would be one that other nations would be obliged to recognize. It's hard to imagine Canada trying to copyright our horseshoe side of the Niagara Falls. Laughable even. Yet Egypt is planning to pass a law to copyright its Wonders of the World and other key identifiable aspects of its ancient history, everything from the pyramids to the Sphinx. If the law passes, Egypt would seek royalties whenever one of its ancient monuments is reproduced. . . . . In reality, Hawass' law will have little teeth. Exact replicas will be few and far between. But it could placate Egyptian voters after a newspaper published an article calling on the Luxor hotel to send royalties to the Egyptian city of the same name. Thanks very much for Chris Townsend for pointing me at this page, which shows some absolutely super photographs of the Giza pyramids dating from the Second World War onwards. I particularly like the ones showing aircraft flying over the pyramids. shortly before her 82nd birthday. She published her findings in her works Non-Verbal Sentence Patterns in Late Egyptian (1967), The Negative Verbal System of Late Egyptian (1970), and (based on the earlier grammar of Jaroslav Cerny) A Late Egyptian Grammar (1975). She also edited several collections of articles on Egyptological topics. In 1972 Sarah Groll founded the Department of Egyptology at the Hebrew University of Jerusalem, which became an international centre for the study of Ramesside texts. The ancient Greeks envisioned a great hunter with a sword hanging from his belt. These days Australians are more likely to imagine a saucepan, or even a shopping trolley. To the ancient Egyptians, the constellation of Orion was identified with the god Sah, a manifestation of Osiris, god of the dead. Since the 1960s archaeologists have been debating why Egypt's king Khufu, who lived some 4500 years ago, had mysterious shafts built into his Great Pyramid at Giza - including one that pointed towards Orion. "For a long time people thought they were ventilation shafts, but they are carefully incorporated into the fabric of the pyramid and don't seem to serve any practical function," says Dr Karin Sowada, a Macquarie University Egyptologist. A possibility is that the Orion-facing shaft "was a stairway to heaven". "In pointing the airshaft to the constellation, the king's soul could exit the pyramid and be united with Orion, where he dwelt as a god for eternity in the heavenly realms." Sowada noted that, as with many interpretations of pyramid architecture, the theory remains speculative, "but it's got legs". We may never know if Khufu reached his afterlife in Orion, but the constellation, now shining brightly in Sydney's northern night sky, seems as good a place as any to establish a new world. Orion, says Dr Nick Lomb, curator of astronomy at the Powerhouse Museum's Sydney Observatory, is the closest large region of star formation to Earth. Wandering west (and partially off-topic) for a moment, I thought that this article about the Touareg of the Sahara might be of interest to some visitors. The Touareg first settled in the Sahara during the tenth century. Sharing a common ancestry with the Berbers of northern Africa, they were light-skinned and sometimes blue-eyed, and formed highly structured groups of nobles, warriors, blacksmiths, artisans and vassals, trading with agriculturalists of different ethnic origins. During the 20th century, however, the Touareg’s fortunes began to change. In 1916, the French colonisation of Aïr saw them surrender control of Saharan trade. Then during the 1970s and ’80s, drought scorched their land and killed their animals. Left with no other option, many Touareg abandoned their nomadic lifestyle for a sedentary life. But in towns such as Agadez, they only encountered more hardship, with high unemployment and cultural conflict with the Hausa majority and, more recently, Islamic fundamentalism. I am tidying up my bookmarks in Firefox, which are outrageously out of hand. Here are a selection of some of the more interesting rediscoveries of articles and papers available online - it is quite a mixture (more to follow next week). The wide and varied connections between Israel and Egypt during the Early Bronze Age/Predynastic are frequently calibrated through ceramics that depend to a large degree on two seriation methods developed for Predynastic Egypt. Petrie’s seriation technique and Kaiser’s Stufe dating method utilize whole forms from mortuary contexts. Because of the ways they were developed and deployed in Predynastic research, a logical tautology exists that makes their usage highly problematic. Radiocarbon dating of the Predynastic is vital if we are to untangle existing ceramic chronologies. But up to now, almost all 14C dates have come from domestic contexts where whole vessels are not usually found and which differ significantly from cemeteries in their ceramic assemblages. A 14C-based chronology of whole forms in the Petrie Corpus is thus highly desirable, but has proven elusive until now. Samples of organic materials and Black-Topped Red Ware vessels from over 100 graves in the Predynastic Cemetery, N7000, at Naga-ed-Dêr have recently been submitted for dating with AMS methods, providing the first comprehensive 14C chronology of a Predynastic cemetery. The results are compared to a suite of recalibrated dates from Upper Egyptian Predynastic domestic contexts, which allows the 14C chronology for the region to be further refined. Absolute date ranges for a number of ceramic forms can be estimated for the first time, and results of early analysis are discussed. The entire 14 page paper is available in PDF format from the above address, complete with photographs, plans and diagrams. So impressive is the layout of the various cemeteries at Giza that one cannot ignore the fascinating subject of how the necropolis came into being. Many have written on the development of funerary architecture at Giza, the extent of Khufu's personal influence, and the innovations versus the parallels with earlier necropoleis at Medum, Saqqara and Dahshur.1 One of the more intriguing questions is: Who got to be buried where? How were these decisions made and when were they made in the course of construction of the cemeteries? Max Planck Institute for Evolutionary Anthropology, Leipzig, and Department of Zoology, University of Munich, Munich, Germany. By Nick Brooks (Saharan Studies Programme, Tyndall Centre for Climate Change Research and School of Environmental Sciences, University of East Anglia, Norwich NR4 7TJ, UK). In Leroy, S. and Costa, P. (Eds.) Environmental Catastrophes in Mauritania, the Desert and the Coast. Abstract Volume and Field Guide. Mauritania, 4-18 January 2004. First Joint Meeting of ICSU Dark Nature and IGCP 490, pp 26-30. Abrupt climate change is often invoked as a trigger for the collapse of civilisations. The fall of the Akkadian Empire and the end of the Egyptian Old Kingdom around 4200 years before present (BP) have both been attributed to climatic change resulting in regional desiccation (Cullen et al., 2000; Hassan, 1997; Weiss, 1997). However, there is widespread evidence that climatic and environmental stress played a major role in the emergence of early civilisations, and that aridification in particular acted as a trigger for increased social complexity associated with urbanisation and state formation. This paper argues that the highly urbanised, state-level societies of the sub-tropical arid belt that emerged in the middle Holocene did so as a result of a process of adaptation to water scarcity. A terrific satellite photograph of Egypt, whcih makes it very easy to pick out some of the most interesting geomorphological features of the desert regions - including the beautiful lines of the Great Sand Sea to the west. Interview by Jill Kamil, herself the author of a very accessible book on Coptic Egypt (Christianity in the land of the Pharaohs). The chief editor of the St Mark Foundation for Coptic History Studies, active participant at International Congresses on Coptology, and author of several books on Coptic history and monasticism, Gawdat Gabra gives courses in the USA and lectures at various universities worldwide, "but my heart is in Egypt," he says. "When Zahi Hawass invited me to participate in the development of the Coptic Museum into a state-of-the-art landmark in Cairo, I was happy to oblige, and I confidently expect that within two years half a million tourists will visit it. But," he adds on a more sombre note, "although the revolution in the media in recent years has led to more awareness of Coptic culture and heritage, and major conservation and restoration have been carried out at monastic sites, there are still few Egyptians who specialise in Coptic archaeology, art, language and heritage. Too many Egyptology students become so absorbed in the Pharaonic era that they have allowed foreign specialists to run ahead of them in the study of early Christianity. This is changing, but not fast enough. The Supreme Council of Antiquities is not being provided with professionals, and it is our fault. Andie, When checking the Al-Ahram Weekly website, be careful of the links in the latest issue. Not always, but often this week (27 December 2007 - 2 January 2008), when I click on the various links on the site map ["Egypt," "Features," etc. ], it jumps back to an issue in October 2007. No idea why, but it has happened several times in this issue. Chris. Egypt might copyright its pharaonic antiquities, from the pyramids to scarab beetles, in an attempt to get paid from the sale of replicas, an official said Thursday. It was unclear whether such a copyright would be recognized internationally. Antiquities chief Zahi Hawass said it would apply only to exact replicas — including scale — meaning someone would have to build a full-size copy of the giant pyramids for it to violate the copyright. "If you (want to) build an exact copy of the Great Pyramid we will stop you," Hawass told The Associated Press. The provision is part of a new draft antiquities law that Hawass before the Egyptian parliament. The bill would also mandate life imprisonment for antiquities smugglers, an attempt to crack down on theft of Egypt's heritage. Under the law, anyone seeking to make an exact replica of a copyrighted pharaonic artifact would have to seek permission from and pay a fee to Egypt's Supreme Council of Antiquities. The draft bill comes amid recent complaints in Egyptian media about money being made by the pyramid-shaped Las Vegas Luxor casino. But Hawass said that and other ancient Egyptian-themed parks and malls around the world would not be affected by the copyright law. Egyptian lawyer Hossam Lutfi, an expert with the U.N.'s World Intellectual Property Organization, said the draft may be baffling since the authors of the works in question are long gone. However, UNESCO and Lufti's organization are trying to develop the idea — which still has not won wide backing — that a nation has the right to defend how its folklore and heritage are used internationally. Jeffrey P. Weingart, lawyer with New York-based Thelen Ried Brown Raysman & Steiner LLP, said the scope of the new Egyptian draft bill is unclear "in terms what it seeks to prohibit and what exceptions apply." "It's also unclear how a novel law such as this one would play in terms of international copyright treaties, enforcement and subject matter," Weingart, who has long dealt with copyright laws in the U.S., told The Associated Press. "Anytime someone seeks to promote and profit from artistic or photographic expression, one walks a fine line between promoting its use on the one hand and protecting material on the other," cautioned Weingart. Zahi Hawass, head of Egypt's Supreme Council of Antiquities, said his country wanted to own the copyright to its historic monuments and would use any money raised to pay for the upkeep of its most prestigious sites. Hawass, an outspoken figure in the usually cautious world of antiquities, said the law had been agreed by a ministerial committee and would go before parliament, where it was expected to be passed easily. It would then apply anywhere in the world, he said. Hawass gave no explanation as to how Cairo would begin the fraught task of tackling any copyright infringements. He said the law would apply to full-scale, precise copies of any museum objects or "commercial use" of ancient monuments, including the pyramids or the sphinx. "Even if it is for private use, they must have permission from the Egyptian government," he told the BBC. Entertaining piece about the reports that Egypt is planning to copyright its ancient heritage, written by Guardian staff news writer Maev Kennedy. I'm very worried about our sarcophagus. It's basalt and brass, remarkably heavy for its diminutive size, clearly displayed on our bookshelf, and I anticipate the arrival of Zahi Hawass into our living room at any moment. Acquired for 15p at a parish jumble sale, I believe it to be a 1920s souvenir manufactured in Egypt rather than a western colonialist rip-off of Dr Hawass's ancestral heritage, but that may not save us. The head of Egypt's Supreme Council of Antiquities is a large man with a short temper, and things may get nasty. When not leading excavations, opening exhibitions, or belabouring the British Museum for not sending him the Rosetta Stone to display in one of the clutch of new museums he's building in Cairo, he has now pledged to go after anyone, anywhere in the world, in search of copyright payments for replicas of Egypt's ancient monuments or museum pieces. Although such a provision is apparently likely to become law, as so often with Dr Hawass's pronouncements it's not clear how much any of this is serious, and how much a display of public huffing and puffing. In the December 2007 issue of the online journal British Museum Studies in Ancient Egypt and Sudan (BMSAES) there is a new article by A.J. Spencer entitled The possible existence of Third Intermediate Period elite tombs at el-Ashmunein. The complete three-page paper is available for download (in PDF format) free of charge. Identifying the mummy of the female Pharaoh, Queen Hatshepsut; uncovering the real face of the boy-king Tutankhamun; restoring the Step Pyramid of Djoser; reopening the Kuttub Khana; discovering a New Kingdom fortress in Sinai, an intact tomb brimming with fine funerary pieces in the Delta and Palaeolithic rock art depicting animals in Upper Egypt -- all part of this year's work for Egyptologists. The year saw several important discoveries, archaeological events and the restoration of ancient Egyptian, Coptic and Islamic monuments. But there was also controversy: a demand for the loan of the Rosetta Stone by the British Museum, disagreement over the planned Cairo Financial and Tourist Centre overlooking the Salaheddin Citadel and the selection of the New Seven Wonders of the World. See the above page for the full story. Click the rock art image for a series of of additional photographs. Pierfranco Dotti is out and about on the web again - my thanks to him for this link. This major exhibition offers a fascinating view into the lives of both royal and average Egyptians with ancient objects and artwork from the earliest periods of Egyptian history to the late Roman period. Excavating Egypt features more than 200 of Petrie's most significant finds – many never before seen by the public. The objects, hidden away in secret storage facilities throughout London at the beginning of World War II, have not been displayed until now. They are part of a remarkable collection of "firsts" and include: one of the world's oldest garments, a rare beaded-net dress from the Pyramid Age, circa 2400 BC; a fragment of mankind's first history book from 2900 BC; the earliest examples of metalwork in Egypt; the earliest examples of glass – so rare the Egyptians classed it with precious gems; the oldest "blueprint," written on papyrus; the first royal monument, from the reign of the legendary Scorpion King, from 3100 BC. Details about tickets and opening times can be found on the Columbia Museum of Art’s website. They have a page about the exhibition. The Egyptian Minister of Culture, Farouq Hosni, has announced that a national committee will be created whose purpose will be to recover Egyptian antiquities which have been removed illegally from the country. El ministro de Cultura egipcio, Faruq Hosni, anunció hoy en un comunicado la creación de un comité nacional para recuperar las antigüedades egipcias robadas, especialmente aquellas "sacadas ilegalmente" del país. Hosni señaló que el nuevo órgano desempeñará un papel significativo en los esfuerzos para recuperar las piezas arqueológicas robadas tanto fuera como dentro del país árabe. El ministro explicó que el nuevo organismo estudiará todas las vías posibles para traer los objetos a Egipto, bien a través de medidas diplomáticas o de acuerdos internacionales. También analizarán la posibilidad de establecer contactos con casas de subastas, museos e instituciones extranjeras que tengan ilegalmente piezas egipcias. Por su parte, el secretario del Consejo Supremo de Antig edades (CSA), Zahi Hawas, dijo que el comité elaborará una lista detallada de objetos arqueológicos en colaboración con organizaciones internacionales para proteger el patrimonio cultural egipcio del comercio ilegal. Cientos de piezas arqueológicas egipcias se encuentran en otros países, entre ellas la más famosa es el busto de Nefertiti, expuesta en Berlín desde 1924 y que es reclamada por Egipto. As the end of 2007 approaches, the average driving speed in Greater Cairo is 21km per hour and going down, remarks Dena Rashed. Perhaps life in the city will come to a complete stop next year? Jam-packed again? Maybe a car broke down on the fork-less 6 October Bridge, or is it a football match at the Cairo Stadium? A high-profile official may be passing, as it were, prompting complete closure for alleged security reasons. Rush hour? An accident? In reality, of course, the number of vehicles in relation to the space available to them is reason enough for the jam; it is simply that, to while away the time, drivers come up with a variety of (conspiracy) theories to explain away the phenomenon. Designed for 4.5 million people, the metropolis is now home to 17. Cairo has always been full of contradictions. Today, incredibly, low-income neighbourhoods are shoulder to shoulder with the luxurious dwellings of the rich (whose investments have yet to trickle down the class hierarchy, we are told). In the last few decades, planning has gone wild, with building regulations and capacity considerations gone to the dogs: in space enough for 500,000 vehicles there crawl two million. Since different parts of the ever more shapeless city are all interconnected -- thanks, in large part, to the 6 October Bridge, which has its own known technical faults and, though frequently extended, along many stretches has space enough for two lanes only -- a blockage at one end of Cairo could result in congestion at the other end. Since 1992, underwater archaeologist Franck Goddio and his team have been researching, recovering and restoring Egyptian artefacts that had lain undisturbed on the ocean’s floor for more than 1,000 years. In the process, they have located the city of Thonis-Herakleion, revealed the eastern reaches of the town of Canopus and discovered a sunken section of the Great Port of Alexandria. Although the precise circumstances behind the submersion of these ancient settlements remains a mystery, the prevailing theory is that the region was flooded following volcanic activity. The monastery of St Simeon will be the Daily Photo for today and tomorrow. The monastery was considerably important in its heyday. It is very large, partially ruined, but it has many fascinating features and some of the original painting survives. Part of the success of its survival probably comes down to the fact that it is not a particularly important tourist attraction. The monastery dates to the 7th Century, but was rebuilt in the 10th Century AD. It was dedicated to the 4th/5th Century Coptic Bishop of Aswan, Amba Samaan. Interesting features, arranged over two floors, are the church, the monks's cells (arranged around a fabulous vaulted corridor), the pottery kilns and the kitchens. Food and water had to be brought from elsewhere, as the monastery was somewhat isolated from the Nile and farming lands. The entire complex is enclosed by tall thick walls, which were characteristic of monasteries of the period in Egypt, and were designed to fend off raids. The monastery was abandoned in the 13th Century. Thanks very much indeed for the comments, emails etc - all much appreciated! I've updated the blog back until the 21st December (they start after the last "Blog Update" which is easy to find by looking for my over-the-top Christmas tree image). Thanks as usual to Kat Newkirk and Chris Townsend in particular for helping sooooooo much with the blog updates. And thanks very much to Bev Webb for the photograph (taken in the Western Desert). If I've missed anything, please let me know. Normal service will be resumed tomorrow. See the above page for more. Congratulations Aloisia! Close to finding Imhotep at Saqqara? In a potential blow to themed resorts from Vegas to Tokyo, Egypt is to pass a law requiring payment of royalties whenever its ancient monuments, from the pyramids to the sphinx, are reproduced. "It is Egypt's right to be the only copyright owner for these monuments in order to benefit financially so we can restore, preserve and protect Egyptian monuments." However, the law "does not forbid local or international artists from profiting from drawings and other reproductions of pharaonic and Egyptian monuments from all eras -- as long as they don't make exact copies." N.B. This story will only be on the above site for a limited period (click the Tourism link). In a blow to themed resorts from Vegas to Tokyo, Egypt is to pass a law requiring payment of royalties whenever its ancient monuments, from the Pyramids to the Sphinx, are reproduced. Zahi Hawass, the head of Egypt's Supreme Council of Antiquities, told AFP that the move was necessary to pay for the upkeep of the country's thousands of pharaonic sites." The new law will completely prohibit the duplication of historic Egyptian monuments which the Supreme Council of Antiquities considers 100-per cent copies," he said." If the law is passed then it will be applied in all countries of the world so that we can protect our interests," Hawass said. He said that a ministerial committee had already agreed on the law which should be passed in the next parliamentary session, while insisting the move would not hurt Egyptian artisans." It is Egypt's right to be the only copyright owner for these monuments in order to benefit financially so we can restore, preserve and protect Egyptian monuments. "However, the law "does not forbid local or international artists from profiting from drawings and other reproductions of pharaonic and Egyptian monuments from all eras -- as long as they don't make exact copies." "Artists have the right to be inspired by everything that surrounds them, including monuments," he said. Asked about the potential impact on the monumental Luxor Hotel in the US gambling capital of Las Vegas, Hawass insisted that that particular resort was "not an exact copy of pharaonic monuments despite the fact it's in the shape of a pyramid." On its website, the luxury hotel describes itself as "the only pyramid shaped building in the world," but Hawass said its interior was entirely different from an ancient Egyptian setting. After 40 years of excavation work, unearthed Egyptian antiquities are now on display in Japan. Discoveries of Japan's University of Wasida are touring the Asian country; first in Miyazaki Museum, then in Sapporo at the Hokkaido Museum of Modern Art and will later be shown at the Kumamoto Prefectual Museum of Art. The Egyptian Culture Minister, Farouq Hosni, said the antiquities would be inched in Sapporo in February and for two months. The same pieces will then be showcased in Kumamoto until June 8. This is the ninth such tour to take place, Hosni said in statements Tuesday, noting that the exhibition was the first of its kind in Japan in 15 years. Such exhibitions are held to bring in the money needed to implement rehabilitation projects to preserve Egyptian cultural heritage, the minister said. Some 317 items dating back to different eras are currently being exhibited in Japan. The Sudanese Culture Minister Mohamed Yousif, during his receiving Dr. Esmat Yehia Chairman of Academy of Arts and the Egyptian delegation, announced his complete support for the nomination of Farouk Hosni the Egyptian Culture Minister for heading the UNESCO. He added that this is the real desire of all the Sudanese scientific, artistic, and cultural institutions. Farouk Hosni, the Culture Minister, announced the finalizing of the integrated project made by the Culture Ministry all over 10 years to upgrade the monuments of Maria area on the northern coast, west of Alexandria and prepare it for tourists' visits in line with the state-of-the-art techniques at a cost of LE 20 million. In press statements, the minister noted that Maria area dates back to the Byzantine Era and comprises an important collection of monumental sites, including the Romanian port. For his part, Dr. Zahi Hawass, the Secretary General of the Supreme Council of Antiquities, cited that at the top of the port, there is a wine factory given that Maria city was known for producing it in the ancient times. 200 meters to the wine factory, the Byzantine House is located which dates back to the Romanian Era and comprises an open yard surrounded by thick walls and a number of rooms inside which a big jar used to store food was found. Mario Capasso (ed. ), Studi di Egittologia e di Papirologia. Rivista internazionale. 2, 2005. Pisa/Roma: Istituti Editoriali e Poligrafici Internazionali, 2005. The second issue of Studi di Egittologia e di Papirologia comprises 15 papers, some of which (marked *) were presented as abstracts at the XXIV International Congress of Papyrology in Helsinki. In the first contribution, Francesca Angiò ("Il nuovo Posidippo" 9-32) examines the newest developments concerning P. Mil Vogli VIII 309 that appeared during 2004. This document is commonly attributed to Posidippus of Pela, and with this paper Angiò continues her contribution published in P. Lup 12 (2003) 7-68, with an accurate review that offers an overview of the principal problems. The next paper, "A Coptic Letter from Two Women", by Roger Bagnall, Raffaella Cribiore and Timothy Renner, deals with P. Alex. inv. 675, probably from the 8th century, which is particularly badly preserved. It was first published by L. S. B. Mac Coull in Aegyptus 66 (1986) 190 ff. This article follows the approach taken by Bagnall and Cribiore in their Women's Letters from Ancient Egypt, 300 BC-AD 800 (Ann Arbor 2006, in press at that time), and offers a new text, translation and notes for P. Alex. inv. 675. The possible reference in l. 12 to Psalm 144.15 and to Psalm 109.1 or perhaps Corinthians 15.25 is really curious. The recipient of the letter, entitled 'papas,' was possibly a bishop, since this title -- as the authors point out -- was common for bishops in post-4th century Greek papyri (36). As befits their vocation, archaeologists sometimes come across as dry and dusty. Not here. "Exciting? Yes, I haven't slept for two days," says a French excavator. In 2002, Dr Vivian Davies of the British Museum made a find in upper Egypt that, according to this BBC documentary, "turns our view of history on its head". "Guess what we've got here," Davies says, examining an ancient inscription by torchlight. "We've got an invasion of Egypt by the kingdom of Kush." The kingdom of Kush? Based in modern-day Sudan, Kush was an ancient kingdom that flourished for 3000 years. Initially Egypt and Kush were friends, partly because the pharaohs had such a fondness for Kush's gold. They liked to be buried in the stuff. As you do. Relations soured, however, when an army of Kushites invaded Egypt in 1600BC. Egypt bit back like a big, angry asp but a millennium later Kush had its revenge. Interesting stuff accompanied by fetching footage and evocative music. THE CAIRO-LOS Angeles Friendship Committee will sponsor Egypt’s first float entry in the world-renowned Tournament of Roses Parade in Pasadena, CA on New Year’s Day 2008. Prize-winning designer Paul Rodriguez has created the concept for the 55-foot float. It will soar 27 feet high and feature an enthroned pharaoh and his consort looking onto an arrangement of sacred lotuses, and Horus, the falcon deity. The only object not covered with flowers will be Egypt’s premier archaeologist, Dr. Zahi Hawass, who will be waving to the bystanders. Because of the time the Holy Family spent in Egypt with the infant Jesus, Christmas is a very special celebration in Egypt. In Egypt, Copts, who are Egypt's traditional Christians, have their own Pope who is the head of the Coptic churches of Egypt and the Sudan. Copts consider St. Mark to be their first Pope. He introduced Christianity to Egypt, and for hundreds of years, Alexandria was the home of the Pope. Today his cathedral is in Cairo, where services are usually held in the ancient Coptic language. A surprising number of Egyptian traditions have survived from ancient Pharonic Egypt, and perhaps one of the most striking is the Coptic calendar. Each of the names of the twelve months in the Coptic calendar retains a vestige of an ancient deity or feast, no doubt reflecting the conservative nature of the inhabitants of the Nile Valley. Egyptian Orthodox Christians (or Coptic Christians) celebrate the birth of Jesus Christ on January 7th, a date equivalent to the 29th day of the Coptic month of "kiohk, or Khiahk", though this date in relation to the western calendar advances over long periods of time. Of course, in many other countries Christmas is celebrated on December 25th, though celebrating Christmas on this date is not unique to the Copts. For example, the Russian Orthodox Church also celebrates Christmas on January 7th. The difference in the dates comes from the difference between the Coptic and Gregorian calendars. This means, for example, that beginning March 1st of 2100 AD, the Coptic Christmas will be celebrated on the 8th day of January in relation to the Western calendar. . . .
Christmas in Egypt is not limited to the Copts. Certainly there are, though limited, a number of other Christian sects in Egypt, some of whom celebrate Christmas on the same day as in the west. However, westerners themselves have a long tradition of spending Christmas in Egypt, and more than a few hotels and other facilities cater to western style Christmas affairs.